The Sunshine Coast Trail is a colossal, local, grass-roots achievement that took decades to grow from dream to reality. A grand vision that reached its culmination with the creation of 14 handcrafted backcountry huts, linking each section together. This means you can access all this unspoiled wilderness without even having to bring a tent! It is 180km in length, from Saltery Bay in the south to Sarah Point in Desolation Sound in the north. The Sunshine Coast Trail is the longest (and completely free) hut-to-hut hiking trail in Canada. What’s more, it can be easily accessed at more than 2 dozen separate points along its length. It is perfect for day hikes, 2 and 3 day excursions, or multi-week adventures at any time of year. Those undertaking the challenge of hiking the trail in its entirety usually start at Sarah Point in Desolation Sound. They hike south all the way to the ferry terminal at Saltery Bay, along coastal paths and up mountain passes, through ancient forests and along the shore of serene lakes otherwise inaccessible to human traffic. You can visit the very detailed Sunshine Coast Trail website to read on for maps and additional information. Another great resource for planning your hike is this Canadian Geographic article from March 2017 which identifies 7 not-to-miss spots along the trail’s 180km length. If you are staying north of Powell River or in Lund, this hike is easily accessed. It can also be broken up into smaller sections to suit your mood or plans. To hike from point to point, arrange ahead of time with the Lund Water Taxi for a drop off at the trailhead at Sarah Point. The trail heads inland and east along the top of the Peninsula. After 2 kilometres it rises to Desolation Bluffs, which give incredible views over the Sound. After this break the trail drops to the beach at Feather Cove, directly facing Kinghorn Island and Cabana Desolation. From here, the trail heads inland through the rainforest, including some strands of old growth, to Wednesday Lake. This warm lake is perfectly positioned on the trail for a mid-day swim. The trail continues south along the eastern shoreline of the peninsula and accesses Malaspina Inlet at Cochrane Bay, before rising again to Manzanita Bluffs – and the first hut of the trail – which gives more incredible views, this time of Savary Island and the northern Strait of Georgia. From here you descend quickly before levelling out and eventually crossing Malaspina Road just south of Lund. With a bit of forward planning you can arrange to have transport available for a return to Lund. A popular alternative is to start and leave your car at the Malaspina Road trailhead. From here hike up to the hut on Manzanita Bluff and return the way you came back to your vehicle. This route can take anywhere from 3-5 hours. Another fantastic day hike north of Powell River. This section of the SCT is accessed up Wilde Road about 5 minutes north of Sliammon. 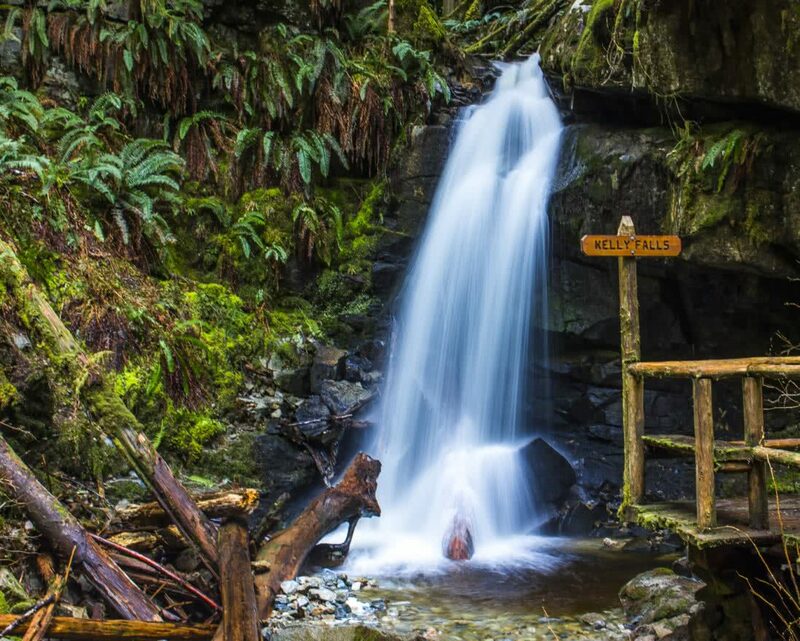 The hike follows Appleton Creek past multiple picturesque waterfalls to an old campsite amongst old growth Douglas Firs. From here you can return to your vehicle along the trail you came, or continue about an hour further to Rieveley’s Pond. Have lunch at a serene lake with another SCT hut, before turning around and returning to the parking lot. If you wish avoid backtracking, park one vehicle at the trailhead and continue in a second up to Southview Road, where you can access this portion of the trail from the north. This adds a little more scenery and distance to the hike, including a pretty gruelling ascent north of Rieveley’s Pond! A steep, difficult, but immensely rewarding hike! The summit of Tin Hat mountain offers – on a clear day – 360 degree views of Powell Lake, Coastal range mountains, the Powell River Canoe route, the Strait of Georgia, and far to west, Vancouver Island. There is also a fully winterized mountain cabin for overnight stays to link different sections of the trail into a multi-day adventure. To access the trailhead you need to drive for 45 minutes or so up numerous active logging roads. These are accessed from Highway 101 south of Powell River at Dixon Road. The way to Tin Hat is well-marked, but requesting further assistance at Tourism Powell River is highly recommended. Be aware that these are active haul roads. Access should only be attempted by private vehicles before 8am or after 6pm, or on weekends. Even then, roads may be used by commercial logging trucks at any time. From the trailhead you can continue straight up the old deactivated road to the summit. If you want, take the longer scenic route past Lewis Lake and along the eastern ridge. Both routes can be combined in a loop for a longer, scenic hike. The Inland Lake Loop is a flat, fully wheelchair-accessible 13-km section of the SCT surrounding Inland Lake. It is easily accessible from town and popular with hikers, swimmers and bikers. Dotted with campsites, small wood huts and picnic areas, the trail is a popular summer recreation area for families, pet owners, trail runners, campers and through hikers. To access the lake, drive up Haslam Road in the Cranberry area of Powell River and turn left at the fork at the top of the hill. After 5 kilometres or so the road forks again: left to the Haywire Bay campsite, and right to Inland Lake. This far southern section of the Sunshine Coast trail is accessed at a point close to the Saltery Bay ferry terminal. It is also the starting point for a couple of fantastic day hikes. Fairview Bay, with a SCT hut, sits in a protected cove round the the east of Saltery Bay at the foot of Mount Troughbridge, the highest point of the entire SCT. You immediately climb a steep wooded slope to a small plateau, before dropping back down to the ocean on the far side. Here you are afforded amazing views of the snowcapped Coast Mountains to the south and the east. The trail follows the shore for a number of kilometres before leading to a picnic area and hut at Fairview Bay. You can return to the parking lot the same way you came, or continue up to Rainy Day Lake. This required another couple of hours of fairly steep climbing. However you are rewarded with the site of a serene lake set amongst moss-covered firs and cedars. Yet another hut sits here on a beautiful bluff overlooking the lake. Spend the night in comfort before coming back down in the morning, or continuing on to the summit of Mt Troubridge! The northern portion of the Sunshine Coast Trail, from Desolation Sound to Powell River, is also the flattest section of the trail, and can be completed fairly comfortably by most people in 2 days. To access, you need to take the water taxi from Lund to Sarah Point in Desolation Sound. Here you begin your hike with sweeping views of Desolation Sound and the Strait of Georgia. Hike through strands of old growth and discover hidden, unspoiled lakes nestled deep in the forest. The trail follows the eastern side of Malaspina Peninsula, occasionally dropping down to touch the shore of Malaspina Inlet, before rising to the first SCT hut at Manzanita Bluff – a scenic rocky bluff with incredible views of the Strait of Georgia, Savary Island, and Vancouver Island beyond. Stay here or continue on, crossing Malaspina Road and hiking beyond the head of Okeover Inlet. Eventually this section links up with the Appleton Canyon and Rieveley’s Pond day hike outlined above. A second hut stands at Rieveley’s Pond. Depending on how early you leave Sarah Point, it can be accessed in a day from the trailhead. The final part of this section hugs the shorelines of Little and Big Sliammon Lakes. It then climbs Scout Mountain, overlooking the Wildwood neighbourhood of Powell River and the Strait of Georgia. As you come down the other side, you find yourself at the Shinglemill Pub and Bistro on Powell Lake. Grab a drink and a hearty meal and relax … the perfect end to a beautiful summer hike! Beginning at Inland Lake, this hike ascends quickly through old growth fir and cedar groves to Confederation Lake. The newest SCT cabin sits on the far end of the lake, and you can choose to stay here or descend fairly quickly again to the shore of Powell Lake. Here you hike the old Fiddlehead Farm site, with its still functioning orchard, to the Fiddlehead Landing hut on the shore of the lake. Day two is a climb. Hike straight up through one of the steeper ascents of the entire trail, to the Tin Hat mountain summit. The majestic 360 degree scenery is reason enough to linger and spend the night in the Tin Hat hut. This flagship cabin is fully winterized and perched on a small plateau just below the peak. The trail continues from here down from the summit and along the banks of Lewis Lake. 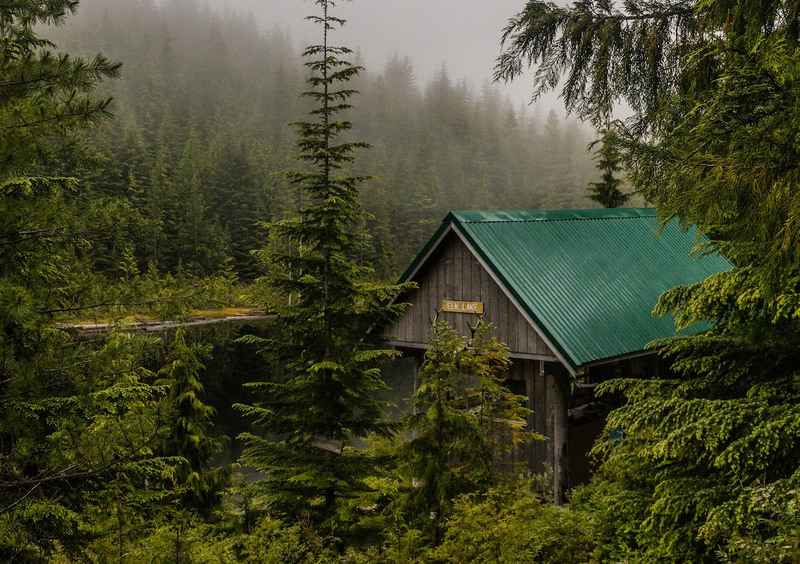 Wind amongst some spectacular old growth forests, cross a main logging road, and risesagain to more huts and Elk Lake, and further along at Walt Hill, where you can choose to spend one or two nights depending on your speed and window for adventure. From Walt Hill you drop again to Dixon Road and the Highway near Lang Bay store. From the southern trailhead of the Sunshine Coast Trail near the Saltery Bay Ferry Terminal, you can climb up and over a slight ridge and descend to Fairview Bay, a picturesque cove with incredible views of the Coast mountains to the south, as well as the first SCT hut on the trail. While it’s perfectly reasonable to stay the night here, if you continue along for another 2 or 3 hours you will climb to a second hut at Rainy Day Lake – fringed with moss-covered trees and warm in the summer months for a refreshing swim. The Rainy Day Lake hut is also perfectly positioned for your assault on Mt Troubridge on Day 2. This is the highest point of the Sunshine Coast Trail, and from the Rainy Day Lake hut you can trace your next-day’s ascent along the ridge line to the summit, which like Tin Hat has a full range of views across the Strait of Georgia to the west, down the Lower Sunshine Coast to the south, and into the heart of the Coast Mountains to the east and north, the lakes and streams of the Powell River Canoe Route glistening in the sun far below. There is a second hut two kilometres beyond the summit – a beautiful fully winterized log cabin that is considered by some to be a jewel in the SCT crown – and from here the next morning it is a long (but thankfully entirely downhill) 18km stretch down to Lois Lake and Dixon Road, where you can arrange for onward transport back to Powell River.